One "really" light frame, wienmann cp.s Campagnolo sprocket and cranks, shimano front derailuer -suntour vista rear - remains of a afa frame pump "holder" - 58 cm dt. 59 cm tt. - pivo stem - simplex shifters. diacompe with hoods. 70745 marked on top left of bb. What is the BB threading? What is the seatpost diameter? What is the headset diameter/threading? What is the handlebar stem diameter where it enters the steerer tube? As per John E., plus what make and style are the dropouts and what is the seatpost diameter? It has a 26.4 dia. seatpost in it. Not sure about the stem, i pulled it but no markings, ill get the ruler out, but it will only be a close guess. (give me a better idea how to measure the headset dia.) and the dropouts-not sure of the style or make, i will post a picture later, but they have no numbers or names on them. they have the "set screws" that adjust from the back, and includes a derallier hanger (not an extra piece). Notice the sticker mark on the seat tube. there is no headbadge hiding under the paint, nor is there holes for rivets/screws. front derailler dates 1988 but fuji seat dates 81. 26.4 tends to point towards french. 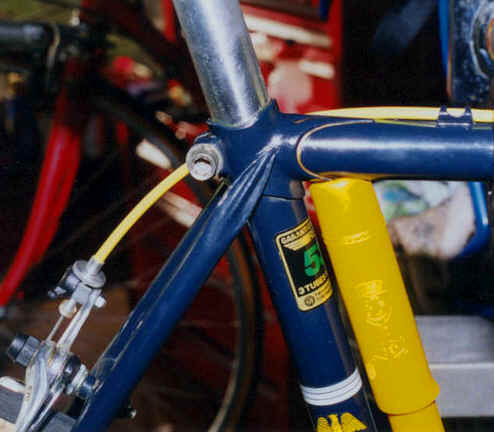 Look for markings indicating threading on the bottom bracket cup. Cable run on the top tube is reminescent of several french manufacturers. Looks pretty beat; can you remove the seatpost and stem? That would be the first problem I'd think about upon aquisition of this frame. Any signs of the frame being repainted/overpainted? Last edited by Noah Scape; 04-24-05 at 06:28 AM. ya - what is the deal with shellac? I've taken apart a couple of old bikes lately with shellac over benotto tape. I haven't ever shellaced anything except woodwork...and I must have missed this trend way back when. What purpose does the shellac serve (I mean, excluding looking cool?)? What purpose does the shellac serve (I mean, excluding looking cool?)? It extends the useful life of bar tape tremendously. Under further examination (with the sunshine helping) -The rear dropouts are marked Brev(?) 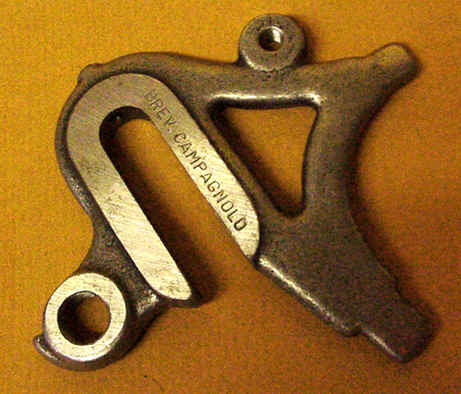 campagnolo. I need a bigger wrench than normal to remove the forks (looking for markings) Have to wait to get one. Yeah, the shellac is a good thing. I'm about to re-do mine I like it so much! Those are steel Campagnolo "Sport" cranks from the early '70s ('71-'74). I think they weren't dated like the Record cranks were. The Sport was soon replaced with an aluminum version, and I believe at that time called "Nuovo Gran Sport"....A couple years later Nuovo Gran Sport was a 5 arm version. A 35x1 BB cup and a 26.4mm seat post both point towards a French bicycle. The Campagnolo dropouts point towards a top end model. We can eliminate Peugeot as they used Simplex dropouts. What is curious are the cable stops on the top tube for a model with Campagnolo dropouts. Most top line models used cable clips. The big remaining clue is probably the location of the serial number. OK... My guess is Bertin. What about something like a Bertin... I haven't seen one in awhile but I remember they used that type of cable stop. Although, I'm not certain about the Campy dropouts on a Bertin and they would have likely had Mafac Racer brakes. t-mar = the location of the serial was on top of the bb. on the left side (non chain). don't know if it helps but has b?m lugs. ? = c i think but not absolutely positive. might be a O.
BCM- Bocama lugs; not uncommon around the mid-late '70s. they look close, but seems that they all have this detail. No; I was just pointing out the BCM lugs. I suspect yours is a couple of years older than JM's blue Bertin, which I think is very early '80s. I've got a Bertin from the early '60s with flat stay caps. I thought of Bertin 'cause I know they used BCM lugs, Campagnolo drop-outs, and lots of braze-ons that many other French non-custom builders weren't all using... My old Bertin even has Campagnolo shifter bosses brazed on to the down tube - made from a modified/cut up clamp-on shifter, and roller cable guides brazed on to the Nervex BB shell. Last edited by TheOtherGuy; 04-24-05 at 08:48 PM. Yes the lugs definately look similar. You can try pulling the fork to see if anything's stamped into the steerer tube. With a 26.4 seatpost, my guess would be Reynolds 531 in a metric size, but Durifort or Vitus could possibly use that size too....? What type of BB shell does the frame use? I think with more clues, we can all suss it out. I suspect most all of the components on that frame may not be original to the bike.